Summary : I very tasty and enjoyable black tea, all on its own. You can always add "junk" to this tea, but it really isn't needed. If you find the taste of loose-leaf black tea a bit too strong, give this tea a try. The flavor is quite tasty but not so overwhelmingly strong like many loose-leaf black teas are. Review : I've had nightmares about this tea. Indeed, I've caught this tea giving me the evil eye the past few weeks...as I've done everything humanly possible to avoid trying this tea. You see, I really don't care for the overpowering taste of a loose-leaf pure black tea. Even some of the bagged black teas have been less than enjoyable...even with sugar, honey, milk, taco sauce and anything else I had lying around added to it. Yet, after having a midnight microwave meal of scrambled eggs and picante sauce, I suddenly became in the mood to try this tea. 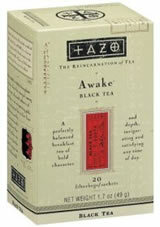 Perhaps because this tea is advertised as a breakfast tea, which is of course why Tazo calls this tea "Awake." And you can keep your comments about my late-night eating habits all to yourself, too! Tazo's Awake Black Tea is a blend of black teas, with nothing else added. Sadly, Tazo is "mysterious" about what blends they are...pooh on them. Here is how Tazo describes this tea : "A breakfast tea of character and depth, invigorating any time of day. Imagine finding yoursel fon a lush tea estate in India around the turn of the century. Your breakfast tea would have tasted a good deal like Awake." See...I'm not so strange for having breakfast at 1am and a black tea right after it. After all, Tazo says this is a anytime of day tea...so there. Now, with that out of the way, let's talk about this tea. Tazo uses some pretty strong words to describe it. And truthfully, while drinking this tea I didn't find myself floating back to India, imagining a tea cup in one hand and a hissing cobra in the other. On the other hand, I was not disappointed with this tea either. Tazo seemed to accomplish a neat trick with this tea, banishing the overpowering taste of black tea through whatever blend it uses. So gone is the bitterness. So gone is the frequentl nasty after-taste. So gone is my dislike for a black tea now, too. Well, I should say, this one. Admittedly, this is not my favorite tea in the cupboard. But it is quite good...especially for a straight black tea. If you shy away from ordinary black teas due to their flavor and bitterness, give this tea a try. You won't be disappointed. And if you live in England and are use to those horribly strong black teas you drink, well, maybe you'll like this one and can banish tradition from your morning routine. But if you can't break free from tradition, I do understand...everyone knows that everyone in the UK is just a tad different. Recommendation : Yes. A very good, tasty and yet not bitter black tea. A very good morning tea, just as advertised...the dreams of India notwithstanding.